IDT's high-fidelity synthetic genes and gene fragments are the result of a long-standing commitment to innovative chemistry, optimized methods, and a robust manufacturing infrastructure. These products are built using their Ultramer® DNA Oligos, which set the standard for quality within the industry, and every gene or gene fragment you receive shares or exceeds that consistently high quality. gBlocks® Gene Fragments are sequence-verified, double-stranded DNA fragments that ship in only a few working days for affordable and easy gene construction or modification, to use in applications such as antibody research and CRISPR-mediated genome editing, as qPCR standards, and more. gBlocks® synthetic genes are available in tubes or plates. 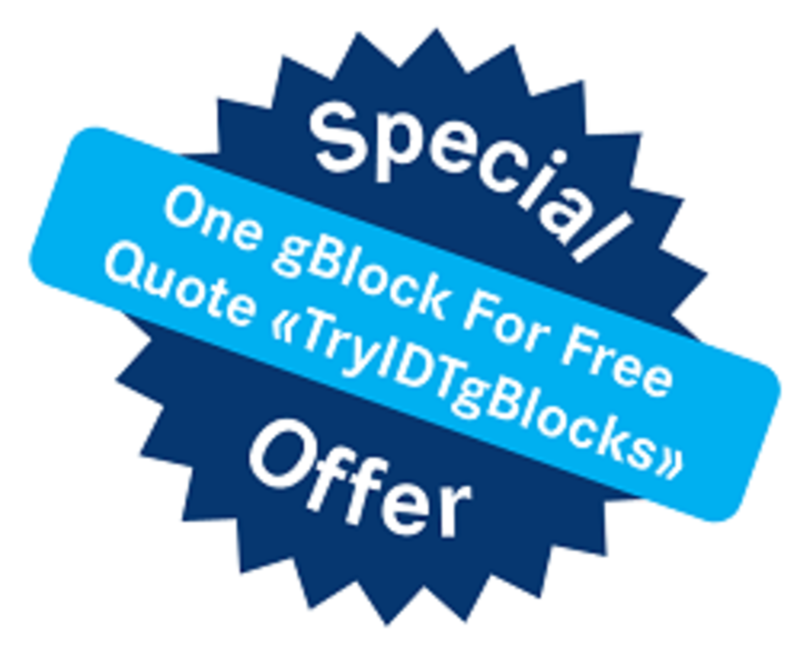 Special offer: receive one gBlock for free! Megamer® single-stranded DNA fragments are sequence-verified, single-stranded DNA strands of length 201–2000 bases. They can be used in applications such as homology-directed repair of CRISPR-mediated genome editing, in vitro transcription, and more. Ultramers® are long, high-quality oligos for demanding applications such as cloning, ddRNAi, homology-directed repair, and gene construction. Ultramer® DNA oligonucleotides are generated by proprietary synthesis methods that deliver high quality oligos up to 200 bases. They are available single- or double-stranded and can be delivered in tubes or plates. IDT's proprietary DNA synthesis equipment permits rapid, high quality synthesis of nucleic acids. This platform is adjusted to a lower throughput mode which uses an "extra rich" synthesis cycle for long oligos. Along with this refined synthesis cycle, Ultramer® DNA oligos use a unique solid support that is specifically optimized to synthesize low-yield, high-quality oligos up to 200 bases in length. Overall, these improvements to their already established manufacturing methods allow you to acquire longer, purer oligos for your research. 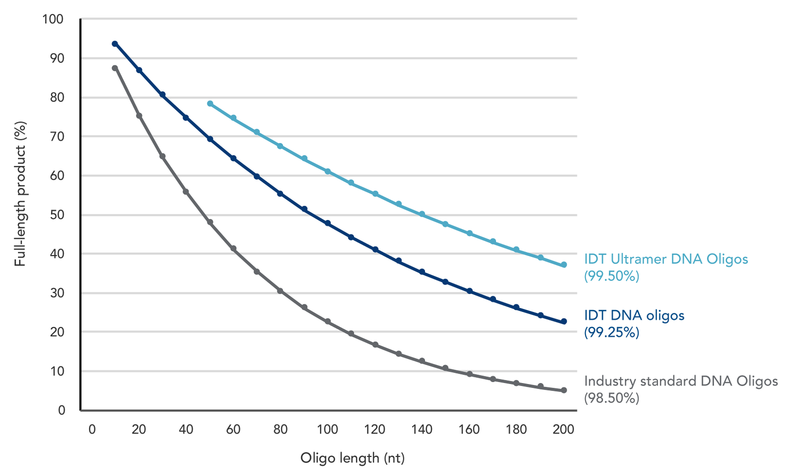 Ultramer® DNA oligos are manufactured on proprietary synthesis platforms that offer higher coupling efficiencies than IDT's standard DNA oligos and other industry standards. As seen in the graph, coupling efficiency becomes increasingly important as oligo length increases. IDT Ultramers® achieve significantly higher coupling efficencies than competitors like Eurofins, Geneart or Genscript.